Pipian Verde is a rich, green sauce from Puebla, Mexico. The sauce has a lovely thick consistency and works well with the textures of the pan fried tofu. Preheat a dry large frying pan and blacken the chillies, tomatillos, onion, garlic and poblano chilli on all sides. Allow to cool slightly then remove any overly blackened parts with a small knife. Place in a blender with two-thirds of the pumpkin seeds, the sesame seeds, vegetable stock and two-thirds of the coriander. Blitz until fairly smooth. Heat the sauce gently in a saucepan for 5-10 minutes adding more liquid if necessary – the pipian should be quite a thick sauce. Meanwhile, preheat the oil in a frying pan and pan fry the tofu for 5-7 minutes until golden brown. Serve the pipian verde on top of the pan-fried tofu steaks and garnish with the remaining seeds and chopped coriander. Any remaining pipian verde can be kept in the refrigerator for 2-3 days. 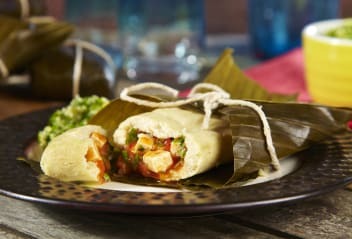 This Mexican tofu dish is our take on the typical street food snack, Tamales. Cauldron Organic Tofu is combined with a spicy red chilli sauce and encased in rich corn dough. 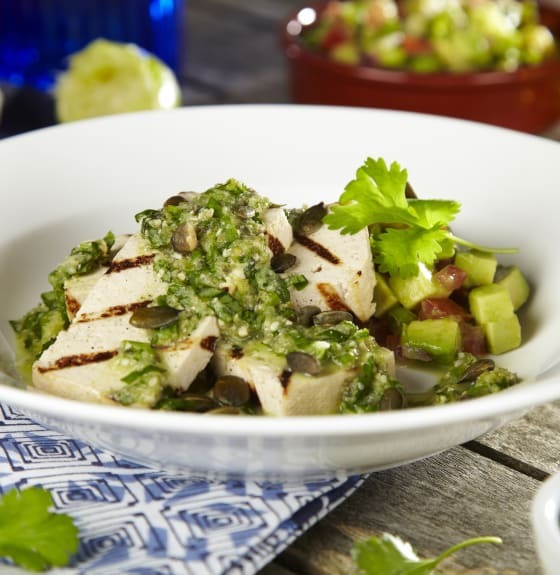 This marinated tofu dish is our take on the Mexican National Dish, Chiles en Nogada. 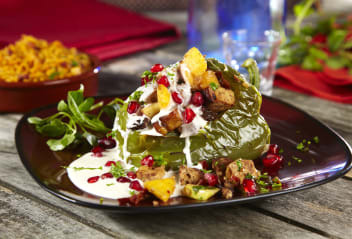 It combines tofu with spices and fruit to fill the Poblano chillies.